Midnight Black 2019 Toyota Tundra TRD Pro CrewMax 4WD 6-Speed Automatic Electronic with Overdrive i-Force 5.7L V8 DOHC 32V LEV 4WD, Black Leather. Want to shop the full Toyota model lineup? Then come buy or lease a new Toyota at San Marcos Toyota! Our Toyota dealership near New Braunfels, TX, has plenty of new Toyota vehicles for sale, making it easy to buy a new Toyota RAV4 SUV or a new Toyota Camry sedan on our lot. If you want reliable, potent performance, lease a new Toyota Tacoma or Toyota Tundra truck. The new Toyota Prius is perfect for those seeking a fuel-efficient Toyota, and the new Toyota Highlander and Toyota C-HR are ideal for those with growing families. 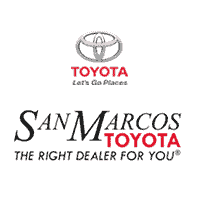 Just view our new Toyota inventory to see which new Toyota car, truck or SUV speaks to you, and lease or buy a new Toyota at San Marcos Toyota!